Property 6: Location&Luxury GREAT SNOW FOR SKIING!! GREAT RATES JAN-FEB!! Property 17: Luxe 'Casa Ole' Condo in Central Santa Fe! Property 20: Close to the best of Santa Fe! HBO, Netflix, Fast WIFI!! 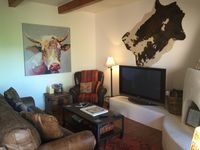 Property 22: Stylish Mountain Retreat with Pool--Close to Santa Fe, Opera, Adventure! Easy Walk to the Plaza, Gated Retreat, nearby Ski Santa Fe! Property 32: Easy Walk to the Plaza, Gated Retreat, nearby Ski Santa Fe! Property 41: Xtra Discounts on 1 Month+ stays!! VinGarage Winemaker Atelier Pets Yes! Property 48: Lovely Garden Apartment 15 minutes from Santa Fe Plaza! 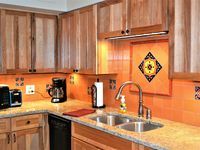 Property 50: **Elegant Adobe Casita bear downtown! Carol's condo is one of the nicest we have stayed in over the past 20 years. Not only was it spotlessly clean, but the beds were comfortable and the furnishings were in good condition without the clutter of too much decor. Towels and bed linens were luxurious. The kitchen was small but well laid-out and the dishes and pans were in nearly new condition. There is an electric fireplace which adds a nice ambiance and a small amount of heat . The laundry room had a solid door so we weren't bothered by the noise. Although the condo is not far from a busy road, the vegetation created a very quiet and serene location and the patio was lovely and private. There is a shopping center within walking distance with two grocery stores and a drug store. The only minus was that the shared shower was not in a separate room between the two bathrooms which would have given more privacy and convenience. It worked fine for us (2 related couples) but might be difficult for those who require more privacy.